BigTeams, one of the fastest growing, easy to use and most comprehensive website and software systems for high school athletics programs today introduced industry veteran Clay Walker as its Chief Executive Officer and also announced an investment round, led by Capital Sports Ventures. Walker is a long-time sports, entertainment and digital innovator hired to lead the fast-growing high school sports digital platform through their next stage of growth in an, “Industry in its infancy,” he told the Sports Techie community blog in our phone chat today. The three hard-working founders still control the major shares of the company while giving up enough of a stake to satisfy Clay and their influential Capital Sports Ventures investors in Washington, DC. There are some 25,000 high schools in the United States making it a fragmented Industry compared to only 32 teams in the NFL, or 1,000 colleges and 500 Division I universities. Walker says less than 1% is spent on athletics in public schools, yet sports enrich the learning environment, culture and community in ways Big Data is helping to shed light on. Their feeling is athletic directors are teaching class, have lunch duty and afternoon study hall, and then might need to coach and deal with field issues, leaving little time for high school athletics programs that need lots of help with administrative work, fundraising and generating community engagement. UCLA or Texas might have a staff of 75 in the Athletic Department who manage everything from scheduling to fund raising for Pauley Pavilion or the new lacrosse fields while some high schools might have one staff member doing it all. BigTeams’ self-manageable system was built for High School Athletic Departments to have a platform that enables communication, provide the department with an informational tool for all users, and help promote school athletics through the use of the Internet. They are the official software of the National Federation of High Schools. Based in the Northern Virginia technology corridor, BigTeams originally launched its web platform in 2008 and now has clients in 41 states that use their school-branded websites, fundraising tools, booster club systems, and fan interaction platforms. BigTeams is not a startup; they maintained slow growth, done mainly though organic means then began looking for capital. Page view on a super user website can have 80,000 page views per month and those numbers can spike certain months such as the playoffs and go over 100,000 or more tally. And that is for one school. Scale that to 5,ooo schools and leagues and the total possible user numbers are impressive enough for any VC to get excited about. Social media is also a big opportunity Walker will be focused on growing immediately. Instead of 35 users tweeting with their just released social enhancements, he wants 500 out of 500 engaged via social media. This is a platform for high school students to post photos and videos of their performances, training and team bonding. I liked the example Walker shared of the X-Country team that does not cut anyone so the teammate that runs a 9 minute mile might not be able to help accumulate running points but she or he or he can contribute by using BigTimes tools to help tell the digital story complete with stats. Inspiring journalists and photo journalists are good candidates to solicit for help. This proprietary system makes it easier to pull in fellow high school staff members to get involved. 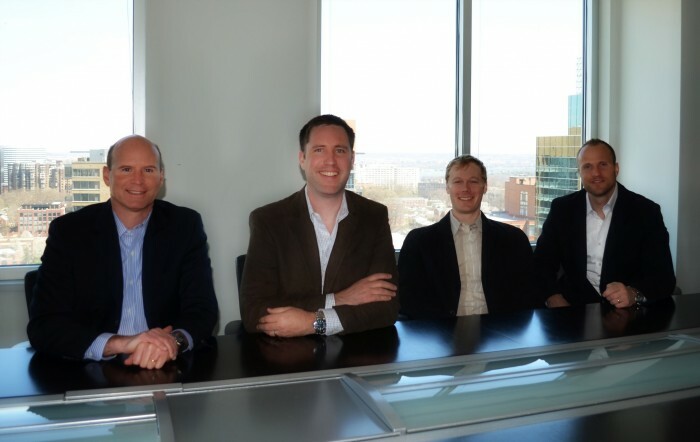 New CEO Clay Walker with BigTeams founders Matt Carson, Jeff Gilbert and Steve Sutherland. The funding round was led by Arlington, VA, based Capital Sports Ventures, which also included SWaN & Legend Ventures (led by Monumental Sports & Entertainment Partners Fred Schaufeld and Tony Nader), Roger Mody, former CEO of SIGNAL Corporation and Scott Brickman, former CEO of The Brickman Group. Capital Sports Ventures is led by CEO Greg Bibb, former Executive Vice President of Business Operations for the Washington Wizards and Chief Operating Officer of the Washington Mystics. Bibb and Schaufeld launched CSV in January 2013. Bibb and Nader will join the Big Teams Board of Managers as part of the investment. Walker told me, “The investment was in the seven-figures.” The investment money will help with staffing, marketing and growth. Walker is equipped for his new role after spending over 20 years in the sports and entertainment industry, most recently at USA TODAY. He loves the space BigTeams occupies. He’s been a Professor at Georgetown since 2008 and with a heavy heart alerted officials he will not be instructing classes this fall. Clay Walker most recently served as Vice President of Publisher Relations at USA TODAY Sports. Prior to joining USA TODAY Sports, Walker was Chief Affiliate Officer, GM and one of the co-founders Big Lead Sports, a successful digital sports marketing and media company start up that was acquired by USA TODAY in January 2012. Before co-founding Big Lead Sports, he served as the Senior Vice President of the NFL Players Association’s licensing and marketing division for 13 years, where he was named to the Sports Business Journal’s Forty Under 40 list. The founders and Walker are on the same page about how very little extra time is available to handle all the administrative tasks needed for high school athletic programs. Parents will send their kids to IMG camps in Florida or hockey camps in Minnesota paying whatever the going rate is to help their kids achieve athletic greatness or earn a college scholarship opportunity. There is certainly big money in American high school sports. Walker feels like his timing at BigTeams is similar to that at the NFLPA in that after five years of litigation under Commissioner Rozell , Gene Upshaw eventually was convinced of the value of Fantasy Football as partners and assets and since Clay was fresh out of business school, they made it happen. The NFL made a switch to one web platform for all 32 teams yet still retained the ability for each team to have local reach. The NBA basketball and NHL hockey digital properties took five years to mature and he feels BigTeams has the same potential. Clay spoke to the NFL last week and shared data that indicated 95% of Fortune 500 CEO’s played high school sports. Adults are eight times less obese if they played high school sports. He plans to renew his relationship with the National Council of Youth Sports and USA Football in order to spur user adoption. The business model is for athletic administrators managing high school programs who are under staffed and over worked to have millennial aged 16 and 17 year olds involved running galleries of homecoming, state playoffs and rivalry games with epic pictures and video uploads. Their new Head of CRM is a, “Critical hire,” says Walker. Customer support needs to scale in order to handle 5,000 schools with a high level of customer service. “Anything less is a disservice to clients,” he said. Walker hired a former Georgetown Sports Digital Marketing class student as their new Head of CRM. She has used BigTeams for three years as a lacrosse coach and had immediate recommendations for UI enhancements and system upgrades. They have never hired a Head of CRM, Sales or HR Director until now after the new influx of capital. Company growth initially came from word of mouth such as a rival school who saw the efficiency and time-saving BigTeams offered. When programs got cut in 2008 because Federal funding was reduced for athletics, states followed suit and made cuts in the athletic budgets. Thus over the years, Booster Clubs have become more significant as high school athletics influencers. When you need new infrastructure, practice facilities or new jerseys, the school does not pay for them like they did when Clay and I were playing in the early 1980’s. Booster Clubs now have a management tool that can help coordinate 150 parents who want to volunteer for a night of bingo fund raising with an alert via the email and text system. I asked him between their websites, fund raising tools, booster club systems and fan interaction platforms, which one has him most excited. He said the New League Scheduling System launching in May, 2014. It will be rolled out locally with public charter schools in Washington, D.C. where 47% of the high school kids in the DC area attend classes. There is a pay to participate acceptance in the market place according to Walker. When the market came crashing down in 1998 and schools where forced cut athletics, this model took over. He says data shows 60%-64% of schools are charging a fee to play and mostly collecting checks for payments. Their new engine that deploys in about 60m days will be streamlined and upgraded so it can function as a league scheduling tool if you have a 5A, 4A, 3A, etc. format. BigTeams is robust and secure enough to use at the highest levels of admin responsibilities. 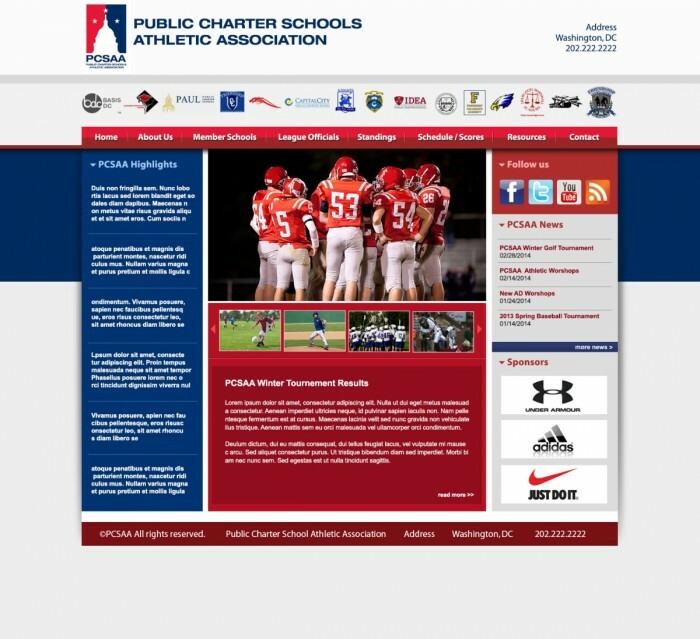 BigTeams is launching the first-ever DC Public Charter school conference website, providing a centralized athletics communications vehicle for the conference and its 27 member schools. In conjunction with the conference website, BigTeams is launching a branded site for all 27 member schools. Selling advertising is the new revenue stream Walker expects to grow using ads, pre-roll and ad inventory templates. BigTeams will sell advertising space to companies that are app appropriate for your high school audience. Your school will be able to block un-wanted advertisements. For all paid pricing models shown above, your school has the option to charge businesses a yearly price for putting their advertisement on your site. Most schools charge $750 per year, and try to sell 10 local businesses. BigTeams charges $120 per ad, per year, to your school. They have graphic designers on staff who can help you or the advertiser with the ad design. For the free advertising model, your school will get a website address like www.yourschoolname.bigteams.com or may pay $49 per year for a custom website address. At some point, their aim is to scale up from 500 users in 41 states to 5,000 in 45 states in a relatively short time frame. Comcast might consider them as a distribution outlet. Perhaps ESPN might come calling one day. Right now, Walker says ESPN is in about 6-12 high school markets but covers it well nationally. The local space is where BigTeams plans to grow fast as they sign up more and more high schools daily. Capital Sports Ventures is a sports and lifestyle properties accelerator that advises, manages and provides capital for sports and lifestyle properties and events. Along with actively investing in the sports and lifestyle industry, CSV offers advisory services to a select number of clients. CSV is a member of the SWaN & Legend portfolio of investments. SWaN & Legend Venture Partners was founded in 2012 by Fred Schaufeld and Todd Klein. Along with CSV, SWaN & Legend’s portfolio of holdings includes Jose Andres’ Think Food Group, CustomInk, Kind Healthy Snacks, Social Radar and Quad Learning, among others. Sports Techie, If you are any kind of any admin with high school sports, BigTeams has invested hundreds of thousands of dollars into programming, development, software, and servers to make BigTeams the cutting edge high school team website and affordable platform that it is. They continue to pour resources into research and development as they look towards the future. Look for upcoming webinars and seminars as well tools for summer camps. The trend set by Michelle Obama and the Let’s Move program, NFL Play 60 and NBA Fit, are only going to help BigTeams succeed because kids are being educated at the grassroots level on the importance of playing sports, exercising and fitness. The NFHS Network is a joint venture among the National Federation of State High School Associations (NFHS), its member state associations and PlayOn! Sports are considered complimentary to BigTeams mission. I especially like how Clay feels that team sports and individual sports offer unique opportunities for youth to learn values, to get along with teammates and to learn leadership skills, and in solo sports, to improve concentration and dedication. My Sports Techie sense feels that by securing funding for business expansion from Capital Sports Ventures and naming Clay Walker CEO, BigTeams will soon used be at your high school by some happy athletic department admins and student millennials.